Before I go on about the Vertical Scrolling SEUCK. I'd like to say a huge thank you to all of the entrants who participated in the 2010 Sideways SEUCK competition earlier on this year. 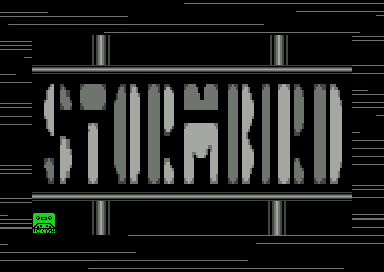 Because of the motivation of various C64 fans out there, I have decided to run a vertical scrolling SEUCK competition, through until November. Yet again, a huge thank you to all Sideways SEUCK entries. The Shoot 'Em Up Construction Kit was made back in 1987 by Sensible Software, and created a cult of games creators in the past. There were various SEUCK classics released to various C64 magazines for inclusion on their cover tape or cover disk. There was also a huge myriad of SEUCK games that were released into the Public Domain. Some games were good, but others were very bad. We even saw some real classic SEUCK games that had major enhancements added. So as a prize for the 2010 Sideways SEUCK competition. I added a new front end on to the winner's game, and added power ups to their game as well as mastered the game as a commercial look production. Now for the SEUCK compo, we are doing it all over again. The Shoot 'Em Up Construction kit has been used to do various clever and fun tricks, which made the game more fun to play. 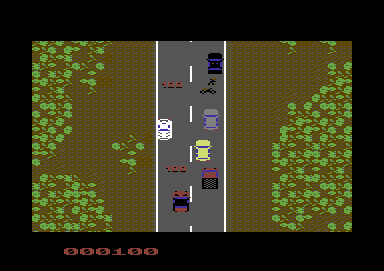 Imagine this, writing a 3D driving game, using SEUCK, where you had a certain amount of distance to travel to win the game, and cars and other enemies try and stop you in your tracks. 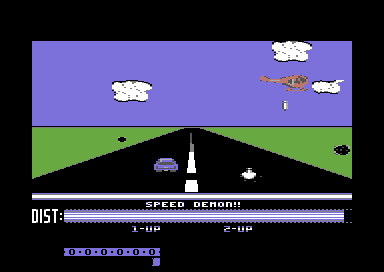 Well, that was SPEED DEMON, a classic Public Domain game which was written back in 1994 by R.Chenery. The player's area was limited. Graphics were nice, etc. More racing games ... Nice! 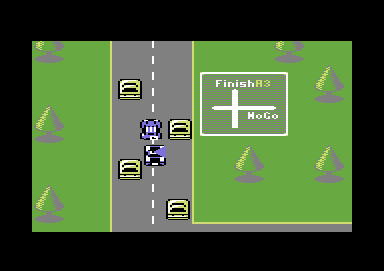 Talking of driving game with SEUCK, there have been two attempts at making a driving game, using this classic utility. Well, these things seem to not be done much. However, Driver by MombasaJoe (Pictured left) and Road Course by WEC (Pictured right) shows examples of possible racing. There's no shooting going on, but Road Course probably has to be one of the best of SEUCK driving games. Driver's also a good game to my opinion as well. Action packed futuristic blasters ... Faster than light! Many futuristic and space war based games have been done to their death, but there have been some great ones in the past. 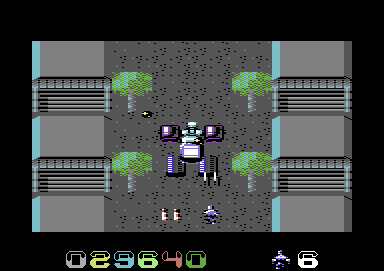 Back in 1992, was Tau Zero by Alf Yngve (Pictured left), in which was a fast paced arcade shooter, in which you have to blast those hostile aliens and try to reach home. Alf did do some other games, quite similar, such as Tau Omega and also Border War and Border Blast. Every single game was awesome. However in 2000, Frank Gasking released a thrilling futuristic blaster called Synetic (Pictured right) in which was enhanced with a new front end, additional tweaks, etc. The game was very good, and one of the best ever SEUCK games I saw in the past. Enter the world of the strange and bizarre ... !!! As well as some awesome futuristic blasters, and driving games. There have been some very strange SEUCK games. 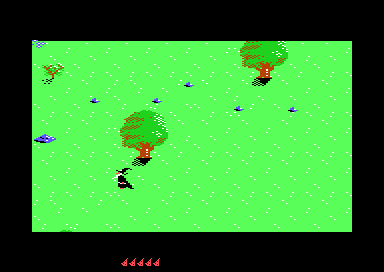 The first of which was Critters (Pictured left) by K.J.N, a lemon 64 contributor. This game was written back in 1995, but never got released until 2009. This was a cute game sort of inspired from creatures. The game starred Ralph, a rodent type of creature, whos teleporter broke down. So he enters the world of nasties and has to try to get through to the correct time zone. Quite a tricky game but worth playing if you love cute games. But wait ... The topic here is the strange and bizarre ... Now imagine this. The very first ever lick 'em up?. During my student years, as well as studying Information Technology First Diploma. I played around with SEUCK and created Nyaaaah! 3. This game had a funny style back in 1996, and it made an appearance on the Fanzine, Commodore Zone's cover mount. The game idea simply was to guide Snodge the Biblet around the park, rescuing his friends and licking the evil biblet clones to their own doom. Because of the success of the licking madness, Nyaaaah! 4 and Nyaaaah! 8, 9, 10 and 2003 all were lick 'em ups. 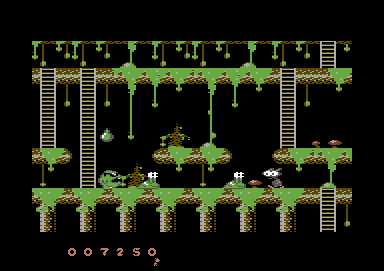 Monster Mash (Released on the Commodore Format power pack 31 and power pack 40 (As Monstermash Editor)- A prehistoric shoot 'em up released in two different formats. They used Novaload this time round, except for the editor, which was that boring clock. Blue Encounter (Released on Commodore Force Reel Action tape #12) - We were treated a-plenty with Gremlin's classic Bulldog, and Jon's Easy Lives. 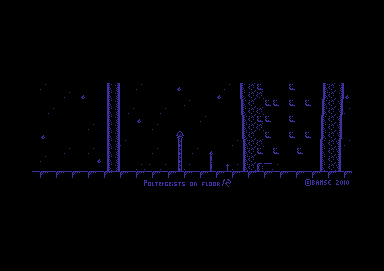 But on the flip side of this tape was a nice looking Blue Encounter game. Graphics were all blue, but the game was fun. 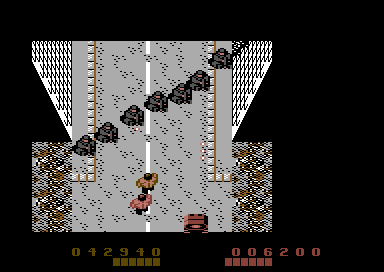 COPS (Released on Zzap 64's Megatape 35) - Eurocity's crimewave was big in this game, so it was up to the coppers to go and clean up the city. There were plenty of thrills and spill with this classic Alf Yngve game. 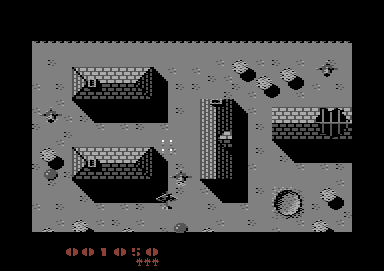 Shotaway (Released on Zzap 64's Megatape 18) - This was a very nice grey-scale game with some really excellent graphics and quite fun game play. Written by WEC. Everything was nicely detailed and long lasting. Sub Burner was another classic by the same author, which was an updated version of Outtake 2 (Zzap Megatape 20). 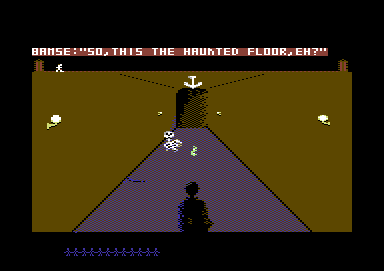 House Case (Released on TND's contributors page) - A spooky, but fun SEUCK classic, which was written back in 1995. Unfortunately the game never got a proper release through Commodore Format because there was no room on the CF 58's covertape. After issue 61 of the magazine. It was the end. CF finally folded its pages September 1995! Road Course made it on to the CF 60 cover tape, before the magazine folded. How not to write a SEUCK game - and sell it! Okay then, who remembers Base 3 by Pirate software? Well, this game was sold commercially back in 1988 and in 1991, I bought this game from the market for £1.99 and thought this looks fun - I like space shoot 'em ups. However due to my major disappointment, I had problems loading this tape on my C2N. So I visited some school friends and tried it on their C64. The game loaded a treat, but when I played the game. It was absolutely a complete rip off. 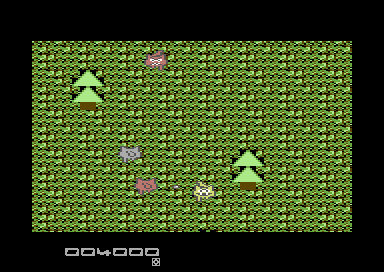 The graphics were bad, and remains of example game, Slap and Tickle were used for this. The aim of this competition is to create your very own shoot 'em up / or whatever type of game you want using the Standard (Vertical scrolling) Shoot Em Up Construction Kit. We cannot provide the SEUCK utility, due finding it difficult to get in contact with the original authors, who own the copyright of the utility so it's up to you to either dig out SEUCK and make your games using it, and transfer from tape or disk into a .d64 or .tap image. Or any other alternative ways. The main aim of this competition is to design and create your own good quality looking and very playable SEUCK game in which must contain varied collectable items (As you'll find out in THE PRIZE section shortly). Your game can be anything, as long as it is 100% SEUCK with no enhancements programmed in to it. The theme for your game can be anything you like, as long as it does not bend the rules. It could something cartoonish, space blaster, combat, etc. However, we want to see really smart in game graphics which stand out and the game to play pretty well. The winner of the Vertical scrolling (Standard) SEUCK competition 2010 will receive a special prize emailed to them. The prize will be a version of your game with additional enhancements, such as power ups, extra lives, new front end with music. We will also prepare a loading picture, cover design/rendering and a special tape master for the production, which will be released on to this page once it's finished. 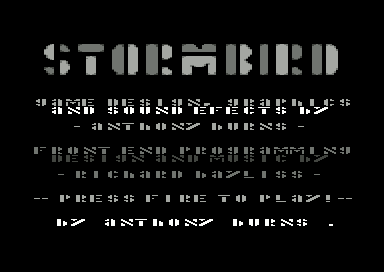 3rd Place - Stormbird by Anthony Burns, with music and new front end by Richard Bayliss. 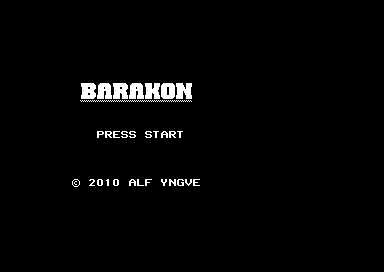 2nd Place - Barakon by Alf Yngve - We have no enhancements for this game, as it is planned to be updated and released on the Psytronik software budget label some time later on this year. The plan for this game is to add a few extra power ups, new front end, high score and also a loading picture as well. 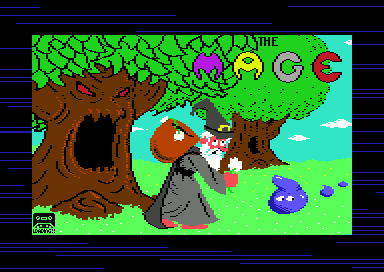 1st place WINNER - The Mage (Il Mago) by Gaetano Chiummo, new front end and enhancments by Richard Bayliss. Loading picture and logo were drawn by Gaetano Chiummo. Entries can only be on .D64, .T64, .TAP images, not .PRG (As this format could get deleted by the email service during submission). 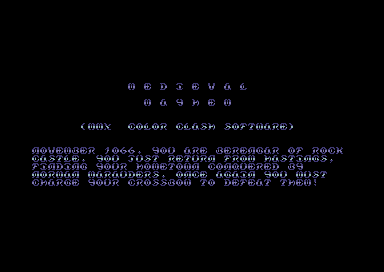 Entry formats are Commodore 64 version only. Entries can be either PAL or NTSC, please include your SEUCK all data file so the game can be loaded and played on a PAL or NTSC version of the SEUCK editor, if there are any problems. Please include a short story and some game instructions/guidelines for your game (Either in your email or as a .txt file or as a C64 note file done with any C64 Note Writer). Your game must not have any in game enhancements or additional code. Music on the title screen is fine by me, but in game music is not allowed. Your entry must be exclusive to this compo page. Please don't upload it elsewhere until after it has appeared on this page. No old games are allowed unless they have never been released before. If the games have not been released before, stamp release date as 2010, no older date. Do not use other people's work and call it your own. Do not use graphics or data from previously released commercial games. Co-op SEUCK games are fine to enter. You are allowed to use graphics and sound from your previous SEUCK games which you made in the past. As long as they all were done by yourself or group of friends. Only one version of your game is allowed. Updated versions of the same game will not be accepted. Do not use names or sources from copyrighted themed material i.e. Licensed TV programs, video games, movies,etc. Do not use real names of famous people/celebrities from television shows, books, politicians, etc (see rule above). Parody games and with ficticious names based on famous people, movies, books, films, etc are allowed. Submissions can be no later than 5th December 2010, but extended deadline may be possible..
Don't forget to include work files of your SEUCK games as well, so NTSC users can load the games into their version of the SEUCK editor to try out. Thanks! Your mission is to recapture a V-2 rocket development base that has fallen to the Allied forces. In order to reach the base, you will have to penetrate several waves of air defences, as well as relentless barrages of anti-aircraft fire from the enemy infantry, and occasional attacks from the heaviest and deadliest bombers the enemy have to send against you. A good mage, Teòdius the Archmage was experimenting with some new spells on creatures from the beautiful land of Noworries, but his experiments had gone terribly wrong. All the good creatures was turned into dangerous sources of evil. Teòdius got worried, and he hidden himself in a cage, and protect himself with a magic circle. There also lived another mage, Durmion, who has to try and break poor Teòdius' spell. To be able to do this, Durmion must find the correct ingredients spread around Noworries. However there are evil creatures that try and stop him. To help Durmion in his quest, he can cast spells at the evil creatures - and turn them back to good again. Watch out as some of those creatures can shoot back. 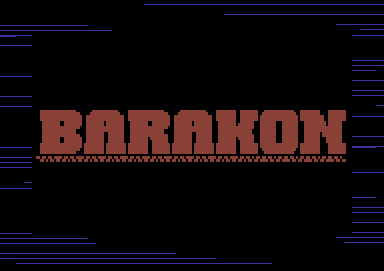 Help Barakon, a cyborg fighting machine fight against the Confederate Militia built by an evil dictator turned president Sara Silone. Fight your way through four different levels through your country, to bring it back to how it should have been. In your way comes Sara's militia and also her powerful robots. Fight those baddies, and avoid falling into the pits or getting killed by the razor sharp vines. Your family waits for you Barakon. Poor Cnotte. He's just heard news of a princess and her fair maidens who have been kidnapped by the evil Pianta - who wants to marry the princess - but she doesn't like him one bit!. Cnotte grabs hold of some hooks and starts ascending his way up the castle, to rescue each person individually. 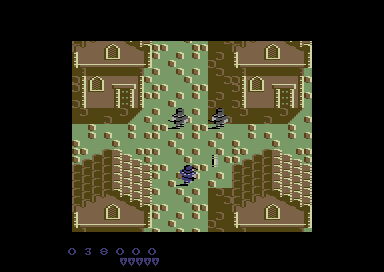 Your quest is to scale up the castle and defeat the evil baddies and guards, and rescue the four maidens and also the princess, through 5 tough castles. At the end of each castle is an evil demon, waiting to stop you in your tracks. Good luck oh brave knight. You are Bamse. You walk the haunted floor to rid it off all evil. Concentrate on your chi, the centre of your mental strength. Move it around to aim and avoid ghosts. Try to catch the inspiration in the shape of butterflies to be granted extras. You have only 1 life to spend in this game. Good luck! "November 1066. You are Berengar of Rock Castle. You just returned from Hastings, finding your hometown conquered by Norman marauders. Once again you must charge your crossbow in order to defeat them." It's a historical setting, don't mean to insult the French (just in case). 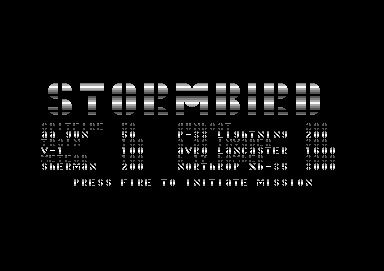 The story is also included in the title screen. 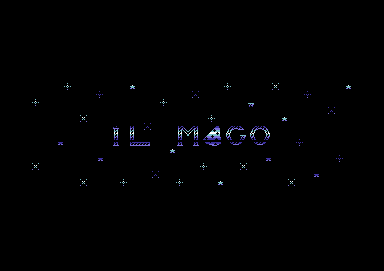 Congratulations goes Gaetano Chiummo for winning the 2010 Vertical Scrolling SEUCK compo with "Il Mago". The prize is ready, but we are still awaiting the tape inlay artwork, which hopefully should be ready some time before next month. A huge thank you go to the other entrants who have participated in the Vertical Scrolling SEUCK Compo 2010. Sorry you didn't win! The SEUCK competition and design is Copyright (C) 2010 The New Dimension and Richard Bayliss.